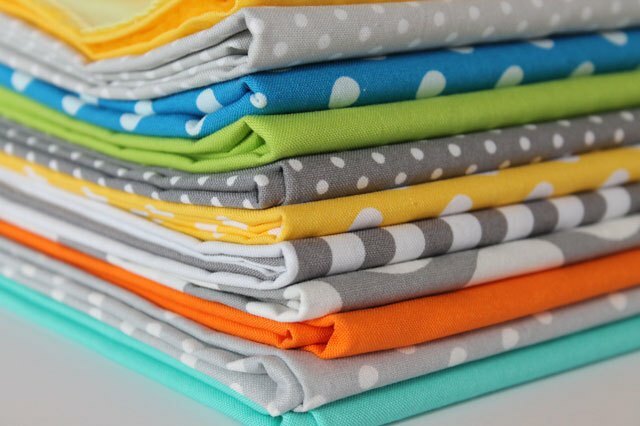 Now that you've set up your sewing machine and practiced different stitches, you're ready to venture into the fabric shop for some fabric and a pattern. It's all so beautiful but the choices can be somewhat overwhelming if you're not armed with a bit of pattern and fabric knowledge. Where do you start? What is that mysterious language on the back of the pattern envelope? 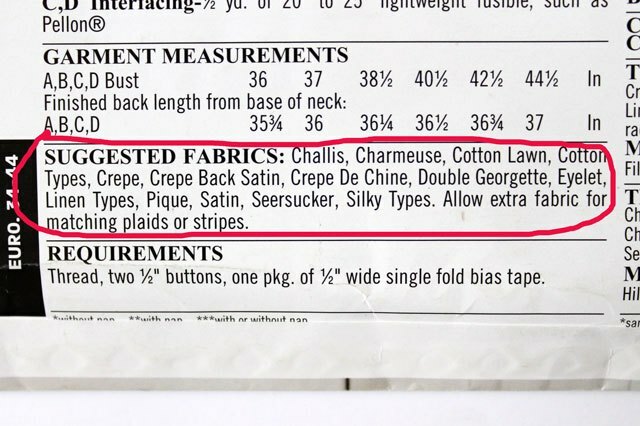 What fabric should you choose and how much? What are those marks on the pattern itself? How do I cut it all out? Well, hold on because you're about to find out the answers to these questions and more. There are literally hundreds of patterns to choose from — dresses, shirts, pants, coats, you name it — there is probably a pattern for it. In most fabric stores, there are big books and many racks of patterns to browse through to find the garment design of your dreams. Once you find the pattern you like, you'll need to read the pattern envelope in order to know how much fabric to buy and what else you'll need to make the outfit. The front of the pattern is pretty straightforward, it has the pattern number at the top which you use to help you find the pattern in the pattern drawers. Directly below the pattern number is the pattern size. And there are usually photos or drawings of the various finished garments you can make with the pattern. Each variation will have a letter printed underneath which you will need later to help you to determine how much fabric to buy. When you turn the pattern envelope over to the back you'll see lots of numbers, letters and columns. The back of the pattern envelope is full of information and can be a bit intimidating, but once you learn what each thing means, it'll all make sense, so let's unlock this mysterious language for you. 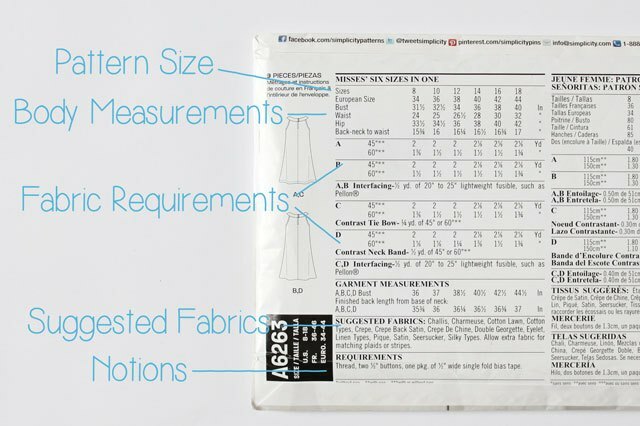 Basically, there are five main pieces of information on the back of the envelope you'll need to read — pattern size, body measurements, fabric requirements, suggested fabrics, and extra things, or notions, you'll need to purchase to complete the garment. 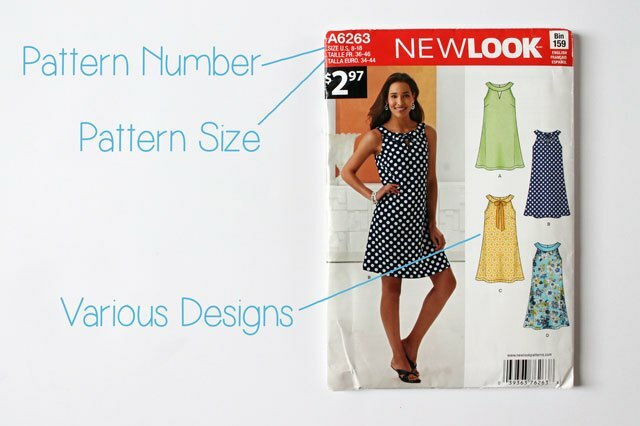 The first thing you'll need to do is determine which pattern size you'll be using. To do this, measure your bust, waist and hips with a measuring tape before you go to the store and bring these measurements with you. For example, if your bust is 34 inches, your waist is 26 1/2 inches and your hips are 36 inches, then you'll be using a size 12 pattern. 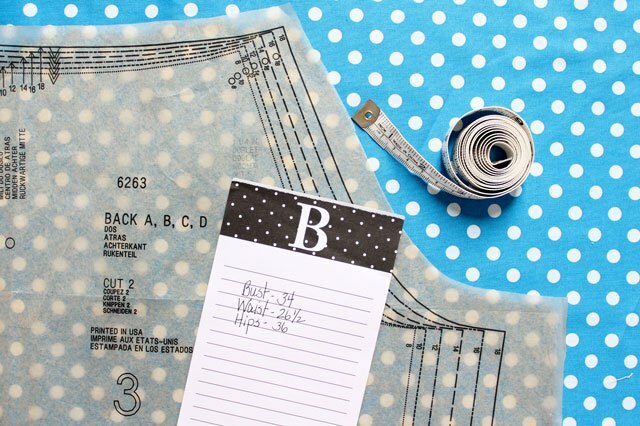 You'll follow the size 12 column down the pattern to determine how much fabric you'll need. Pattern sizes are much different than ready-to-wear sizes. 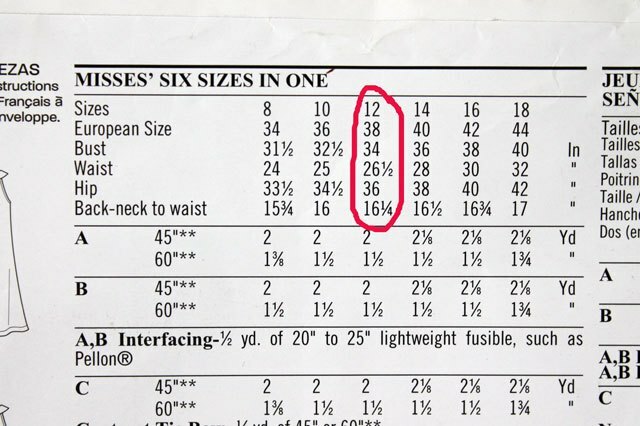 A size 12 pattern size means something different than a size 12 ready-to-wear. If you usually wear a size 8 or 10 dress, your pattern size will be a couple of sizes larger like a 12 or a 14. So be sure to use your body measurements to determine which size pattern to use. After you determine which pattern size you'll be using, you'll follow this column down to determine how much fabric you'll need. As you remember from the front of the envelope, there are usually several different variations of the garment that you can make with the pattern. Under the picture of each garment is a letter. 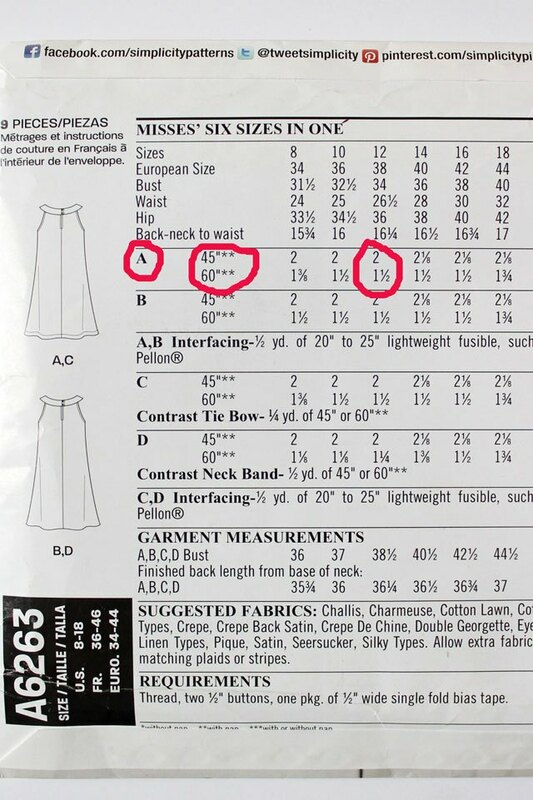 Use the letter under your desired garment and follow it across to the size 12 column to see how much fabric you'll need to buy. Next to the letter you'll see a 45" and a 60". This is the fabric width. For example, if you're using pattern variation A and a fabric that is 45 inches wide, you'll need to buy 2 yards of fabric. If your fabric is 60 inches wide, you'll need to buy 1 1/2 yards of fabric. It's important to look at the suggested fabric section on the pattern envelope. The list has fabrics that will suit the garment and hang nicely when the garment is finished. Choose fabrics from this list to use for your project. The requirements, or sometimes called notions, are the extra things other than fabric you'll need to purchase in order to complete the garment such as zippers, snaps, thread, buttons, bias tape, etc. Now that you're home with your new pattern, fabric and everything you need to make your new garment, you'll want to get started right away, but there is a very necessary (though not very exciting) thing you'll need to do first. You will need to prewash and dry your fabric. This step is very important if you'll be washing your garment later. Some fabrics shrink and change drape a bit after washing and drying and you'll want to get this out of the way before you sew. Once your fabric is washed and dried, press all the wrinkles out with your iron. It's important to have nice smooth fabric when you're cutting out your pattern so everything is accurate. Then fold the fabric in half lengthwise with the right sides together matching the selvage, or the woven lengthwise edges, and press again so you have a nice crisp fold edge. While your fabric is washing and drying you can get your pattern ready. First, open up the envelope and pull everything out. 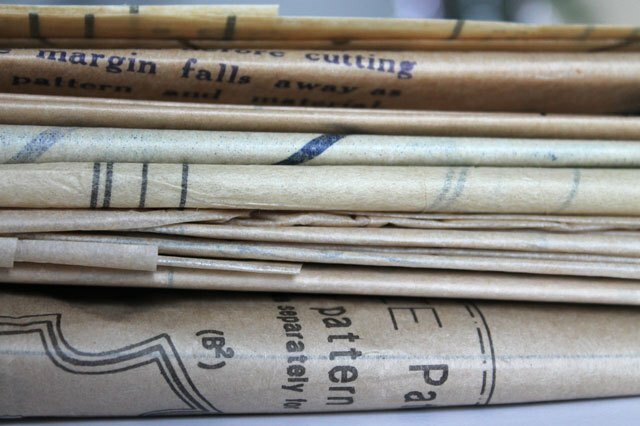 You should find a big folded paper sheet with step-by-step directions and huge sheets of folded tissue paper covered with pattern markings. Open the directions and the tissue paper sheets. The tissue pattern pieces will be all wrinkled from being folded in the envelope. 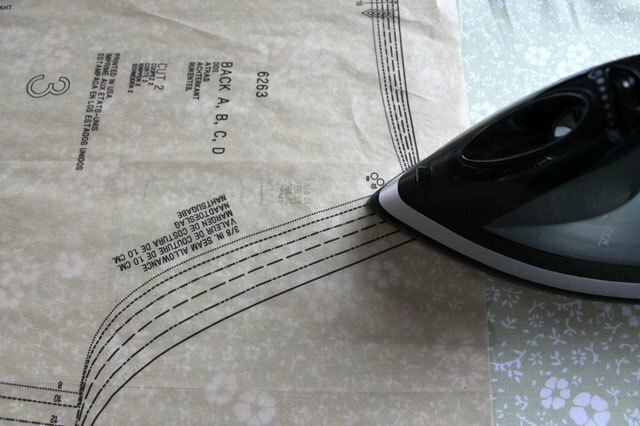 Smooth out the pattern by gently pressing it with your iron. Make sure your iron is on a low heat with no steam. Pressing the pattern will ensure that your pattern will be cut out accurately later. Patterns come in multi sizes so before you use the pattern to cut out your fabric, you'll need to cut your pattern to the size you determined earlier using your bust, waist and hip measurements. Each size has a different line to follow in order to cut out the right size pattern. 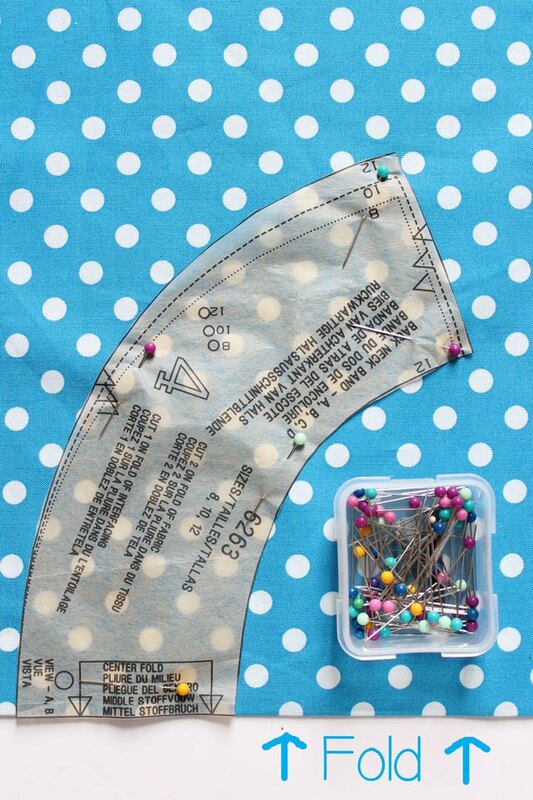 If your pattern is a size 12 then you'll cut your pattern pieces out along the size 12 lines. After you cut the pattern pieces, you'll pin them to the fabric so you can later cut around the pattern pieces using a sharp pair of scissors. The pattern directions will have a cutting layout diagram. This will show you which pattern pieces to use for the fabric width and how to place the pieces on the fabric. It's a good idea to place and pin all the pieces before you start to cut to make sure you have enough fabric. 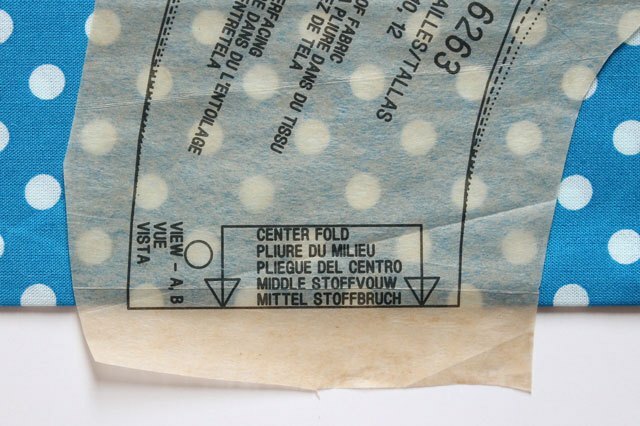 When pinning the pattern to the fabric be sure to pay close attention to the double printed arrow on each pattern piece. This indicates the grain line. The grain line runs parallel to the selvage edge of your fabric, which is the woven lengthwise edge. 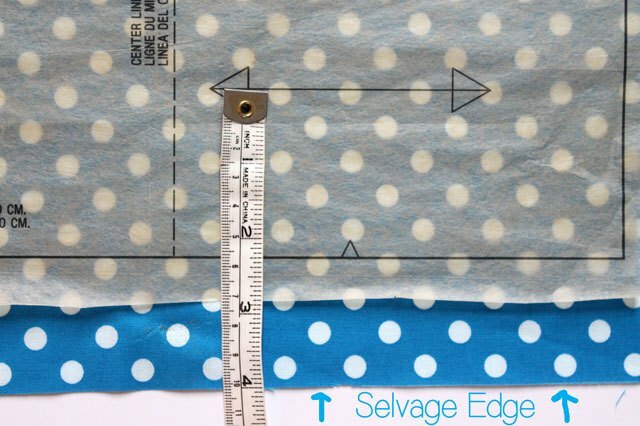 Use your measuring tape and measure from the selvage edge to one side of the grain line arrow. Pin in place, then measure from the selvage edge of the fabric to the other side of the arrow, making sure the two measurements are the same. It's important to cut the pattern on the grain line so it will hang and fit correctly. Line up the fold arrows on the fold of the fabric and pin in place. When you cut this out, you will have a symmetrical fabric piece. The little half triangles on the pattern pieces are there to show you where to cut a notch. 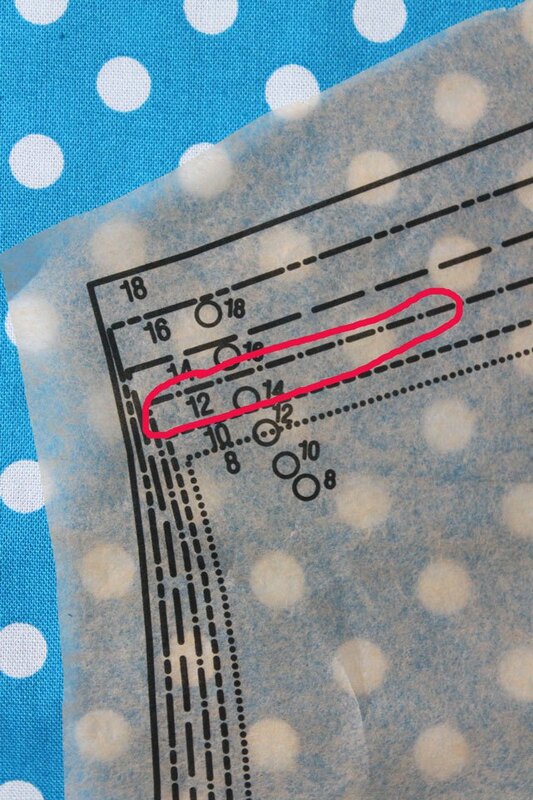 Instead of cutting straight across the pattern at these points, cut a half triangle out into the fabric. 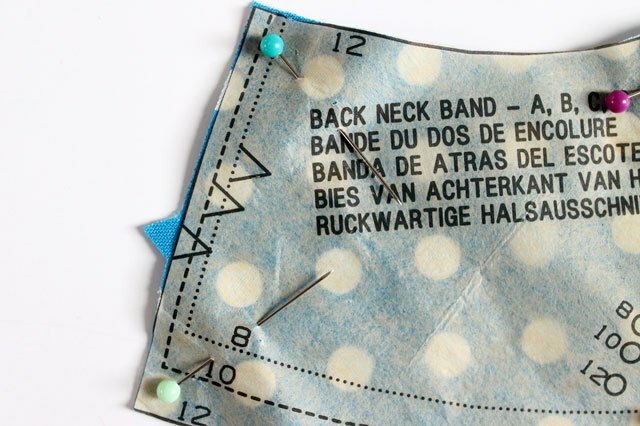 These notches will help you line up the pattern pieces together when you sew them together later. 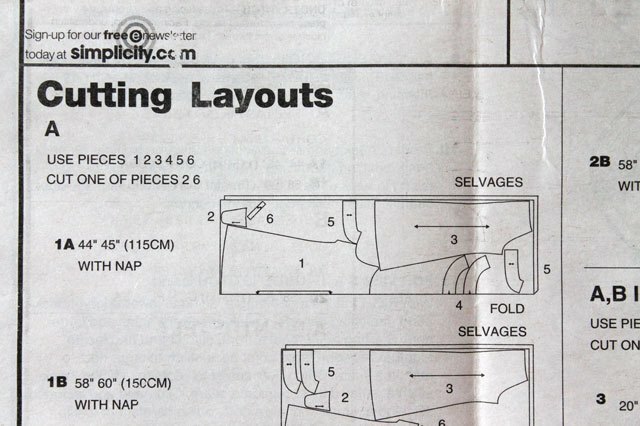 Now that you've cut out your pattern pieces, you're almost ready to sew. Next, you'll need to make marks on the fabric from the pattern pieces and learn some new vocabulary in order to understand the directions that come with the pattern. Don't miss the rest of the series! How Much Material is Needed to Make a Queen Size Quilt?